If so, you need to be aware that the law in England governing smoking in the workplace changed in June 2007. Up till then, it had been possible for employees who smoke to do so, either at their workstations or in designated smoking rooms, such as canteens. With the introduction of new legislation, smoking in the workplace has been completely prohibited, even designated smoking rooms being outlawed. So what provision will an employer make for his staff who smoke? He can’t allow them to smoke in his building, so smokers will have to go outside. Employers will probably feel that having provided a smoking room in the past, they now need to offer their smokers some protection from the weather. The perfect solution is a QMP Smoking Shelter. This is for a number of reasons. Firstly, Smoking Shelters protect smokers from wind and rain, whichever way it is blowing, by ingeniously positioned panels on all four sides. Secondly, they come with optional ash trays, allowing you to control litter on your site. Thirdly, with a Smoking Shelter you have overall control of where smoking takes place on your site, with the benefits of reduced fire risk, and of keeping smokers out of sight of visitors. 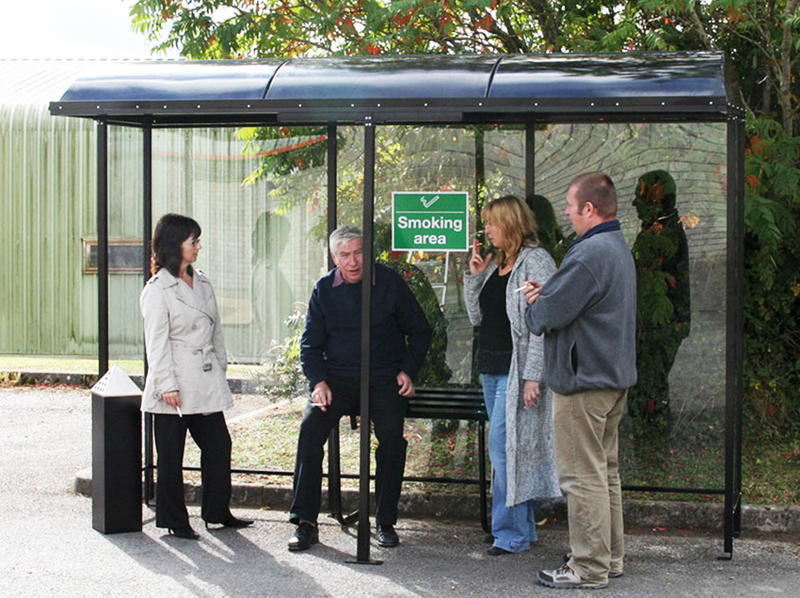 QMP Smoking Shelters are suitably robust, made from strong tubular steel pillars covered in tough plastic panels. They are easy to self-assemble and erect on to 250mm thick concrete. Prices start at around £2,000. For more information on Smoking Shelters please feel free to contact one of our sales team at NSI Projects free on 0800 027 1966 FREE.